The sun is shining, thy sky is blue, and you have mountains around you. We decided that we will visit a mountain with a waterfall. It shouldn’t be a long tour, so we just took the minimum of equipment. The first question was clarified and we started our hike from the parking lot in the Kuhfluchtweg. The first part leads over the forest adventure path. This is interesting for young and old and really nicely designed. You can get to know nature with all your senses. Quickly you can hear the water. The path starts to rise slightly and follows detour the Kuhflucht moat. On the “Königsweg” (king’s road) you can discover some of the small waterfalls, a small cave, and a steel girder of the former bridge, which was bent through the water. Once you have arrived at the Kuhflucht waterfall, you can have a break on the viewpoint. This is covered and offers a great view of the gorge. We didn’t miss the opportunity to climb down to the water. A wonderful refreshment with these temperatures. From here a bridge leads over the water. On the other side, a narrow, secure path begins, that leads further up. After a short time you reach another viewpoint. You also have the opportunity to walk into the gorge for a short while. But here ends the way. It almost looks as if you could go further in the past, but that is no longer possible. The path changes the direction now. Before we followed the path, we climbed into the gorge. For the view it is not necessary because there are also slippery spots and the area is not harmless. Through the said temperatures, the water attracted us again. After another cooling down, we went towards the “high Frick”. 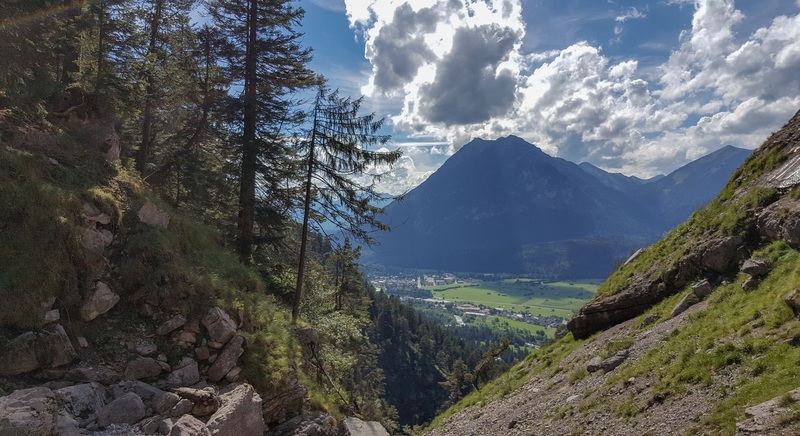 The trail winds up in serpentines, up to a beautiful viewpoint on about 1000 m.
Here you can take a deep breathe again and enjoy the wonderful view of Farchant and Garmisch-Partenkirchen. In the distance you can see the Zugspitze. We followed the road further through the forest until you come to a small branch. At this one you turn right, following the green markers. The path is very narrow and stony. Detour it steeply goes down. At the end of this path you arrive at a small plateau. The many “Steinmandln” and prayer flags mark the point. As we were there in August, the water flow was significantly weaker than during rain or the melting of snow. Nevertheless, a great sight that you should have experienced live, as the water shoots out of the middle of the rockface. The surrounding countryside is also breathtaking. You should be aware that the path becomes more and more difficult. I would recommend mountain shoes to anyone. Whoever has time and pleasure can also go to the “high Frick”. Otherwise you start the descent over the path you have come. We opted for the slightly different route. This should be done, if at all, with sufficient experience, stamina and the right equipment. It went directly over the boulder field down to the river course. The descent was very feasible for us and was rewarded with a wonderful cooling in the water. After an extensive break to collect strength, we had two possibilities. Return to the top of the boulder field or follow the flow. We decided to follow the course of the river a little before it plunges into the first gorges. From here we changed the direction to get back to the path and came to the next Boulder field. These can be very tricky, because they are almost always in motion and with a false step, everything starts to slip. Of course, it also depends on the gradient and the size of the debris, how safe or unsafe it is. Even the big rocks can suddenly drop down. After the time-consuming crossing it went again a bit upward. Arriving on the right path, we needed to stop for a moment. We used a lot of energy there. I would like to mention one thing at this point. On the mountain, if you are not careful, you come quickly to your limits. While the body still mobilizes some reserves and the adrenaline „pushes“ you. But then comes the complete exhaustion. And then also a descent is damn heavy and dangerous. So we started again with the descent towards the waterfall. In the meantime, it was no longer so hot, which made the descent quite pleasant. To sum up, I can say that it’s really family-friendly till you reach the bridge. From there on, you should definitely be surefooted and if you want to go with children, take the kids hand. Of course, this also depends on the age. The excursion is really worth seeing and everyone can make it as it suits him. If you are next time nearby, plan the Kuhflucht waterfalls that can be seen from far away.